Back in Ti.. Back in Time! If you haven’t played our game yet, I recommend you do before reading this blog post. Disarranged is a game about a depressed man dealing with his life. We expected to get higher than this. People seemed to like the artstyle. Oh well. We predicted this would actually be our lowest scoring category. We’ll take it. The gameplay mechanic itself wasn’t very innovative, so I was surprised we got such a high score. But I guess in other aspects or game is rather unique. I think the audio did a really good job of setting the mood. Happy with this score. In the top 50? Awesome! This is the highest score I’ve ever got in audio. Really happy with this. This is probably the most surprising score. We thought the gameplay was too basic for us to score high in this category. Apparently not! I’m actually really salty we didn’t get gold, haha. Humor was definitely the focus of our game. But it’s still a medal so we’re glad. Well.. no. That was a lie. Let me tell you a story. The story about the birth of Couch Man. 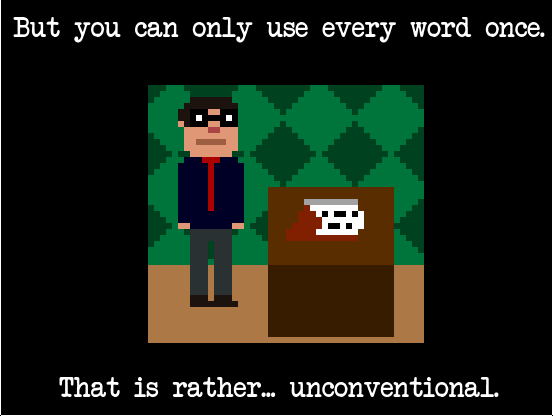 Like always I do the Ludum Dare compo. I couldn’t really think of anything, and when I finally had an idea, it didn’t take long before I quit. My best friend who nicknames himself Mojosaman was doing Ludum Dare for the first time. He’s not a very good programmer though, so I suggested we work together. His gameidea was vague. You’re a guy who has to take care of your little sister. But you’re also depressed so you gotta take it easy or else you will get fully depressed and you will turn into a monster. Something like that. And so we did. Screw this whole taking care of your sister thing. You’re not the guy, you’re the couch. You’re Couch Man! I’m really happy with how the game turned out. We got to see a lot of streamers play our game, and it was great to see how they all got a big laugh out of it. I was mixing up unconventional with inconvenient. That’s why this cutscene in my game doesn’t really make a lot of sense lol. Play TypeFighter! A game about typing words to fight bullies! LD32 Progress Pic #7 – Boss Battle! LD32 Progress Pic #2 – Nobody can stop him now! LD32 Progress Pic #5 – Screw walls and platforms! Instead, you can only use every word once! LD32 Progress Pic #3 – A new ability! LD32 Progress Pic #4 – Fight! Fight! Fight! Hi there! Does it surprise you? After 10 Ludum Dares it shouldn’t. I’m in! Stream: Here. I will try streaming, but I will quit if I think it’s too distracting. Now that’s done, I want to talk about my art, and how my skill has changed over the past Ludum Dares. Let’s start, shall we? What is this? A square headed creature I guess. It doesn’t even have arms. And look at those dotted eyes. It’s hilarious how bad I was when I started. There’s some progression. I’ve added a mouth and arms. I even made hair for the female character. Look at the details! A tie, a beard, and a hat. He even has shoes. If I keep getting progressing like this, I will be the next Paul Robertson in no time! Well.. uhm.. I mean.. he’s standing in a really difficult position. And the other guy has a hand. OH AND EYEBROWS! Yes, I managed to do eyebrows. And uhm.. HAIR! Look at the details on those costumes. the beard of the wizard. Those lines under the eyes of the soldier. You can really see my progression in this art. Let’s see what’s up next! Well… they don’t have a mouth, or much detail. But the woman is holding a baby, so that’s something. Baby choking :D! I mean.. baby choking..
*cough* Okay, on to the next one! Well, they don’t have arms, legs, hair, or humans skin. But they have emotions, so that’s something. Right? And this is the last one. Those are some fine details in the costumes, they don’t show a lot of emotion, but they have noses and hair. .. sigh. So there you go. My great progression in pixelart. Maybe in 3 years, I will start using shadows and more advanced stuff like that. Who knows? I just gotta keep progressing, and avoid hitting my head. Thanks for reading, and good luck! 66 queries executed in 0.127 seconds.